Olympus Griddlers is rated 3.5 out of 5 by 22. Rated 5 out of 5 by vlalex1 from Fun Challenging Puzzle Game I can play for hours and hours. It is addictive and challenging. Trying to figure out the puzzle and not to earn any stars to lower the score or have to repeat a level takes logic and brain power. I wish there were more of this type of game as it exercises my brain and my patience. Rated 5 out of 5 by arnold1049 from EXCELLENT EXAMPLE OF THIS TYPE OF GAME There are 6 rooms/locations with 20 levels/grids within each room. Points are earned when specific tiles are clicked correctly. Each grid starts out with 3 stars; with each mistaken click, one star is lost. In order to unlock the next grid, you must earn enough points, or make no mistakes and maintain the 3 stars. With this many grids available for play, this is a game that I will keep going back to; it isn't something that can be finished quickly. There are no time limits on the grids, which is a big plus in my book. Each grid starts with one available hint. Hints are added randomly as play continues. If you run out of hints, you can purchase more hints or have mistakes forgiven using the points you have earned. 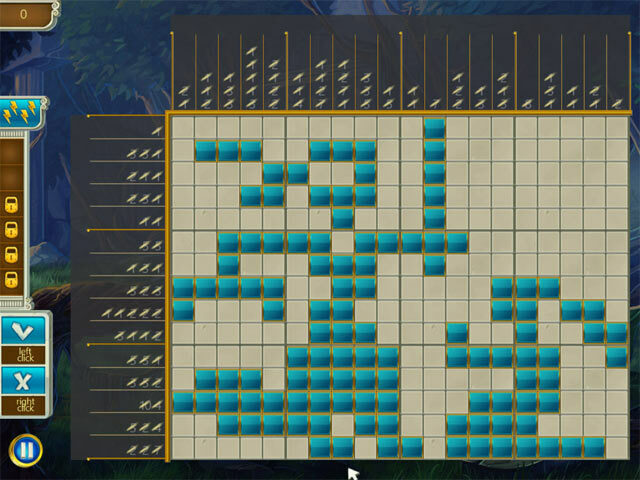 Even if you run out of hints once, with continued play on the same grid, you will earn more hints. 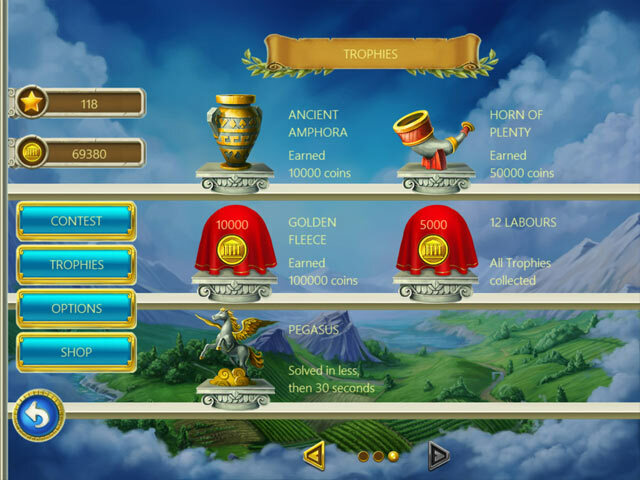 There are also 17 trophies to earn, 6 for completing each room, several for earning stars and various amounts of points. There is also one for using 15 hints. There is one that I believe is unattainable; finishing a grid in 30 seconds. And since this one is unattainable, it makes another one also unattainable, winning all the trophies. 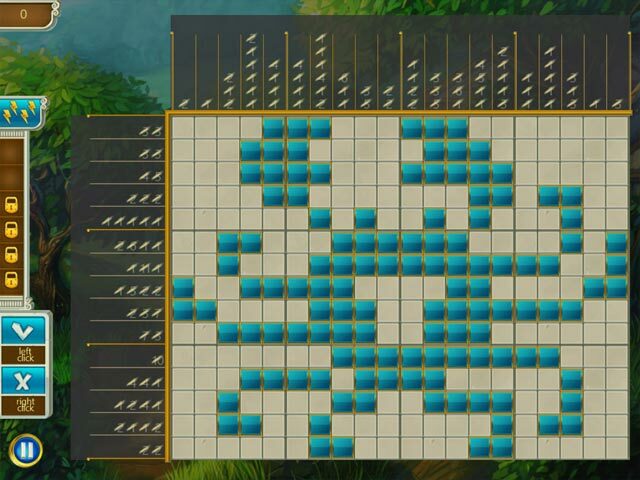 This is a little frustrating, but I guess if you had the time and patience and copied a completed grid you could possibly make the 30 second trophy. Winning all 17 trophies isn't that important to me, particularly if you have to cheat to do it. The grids are not too big, which means the tiles are good sized and don't lead to misclicks. But don't let the size of the grid fool you; they are not easy. I used a lot of hints, including ones I purchased. The only other thing that bothered me was that it was hard to see when I made a mistake. Often I would finish a grid, thinking I had made no mistakes, only to see that I had lost a star and had to replay it to keep the 3 stars, I know an "X" appears to the left of the grid to indicate a mistake, but when I am concentrating on the grid, I don't see the "X's" until I'm through. Maybe a red circle or some other visual (not audio) clue to indicate a mistake had been made would be a good addition. The graphics are excellent with colors that are easy on the eyes. This is a very enjoyable game, not too easy but also not so hard to be frustrating. Rated 5 out of 5 by tobious from another great griddler I have found these to be my favorite games right now. You don't have to start out as a beginner, you start out with good grids. I don't think the pictures are the greatest but I like that it gets a bit harder as you level up. Rated 5 out of 5 by pdmorrison1 from Love mosiac type puzzles Another welcome addition to the "griddlers" collection. It is a mosaic puzzle, you really don't need much of a storyline. In this game you earn coins to buy extra hints, mistake forgiveness, etc. These are wonderful games and this is no exception. A great game for the whole family. Rated 5 out of 5 by DRAGONWYN from LOVE SOMETHING DIFFERENT I've not played another nanogram game except as mini games in adventure and hidden object game. I enjoyed the mini game when I played them and was curious when this one came out. 1st because of the theme and then when I saw the type of game. It is a pity there really isn't a story line but we can't have everything. Sometimes that's fun but sometimes if it's not a great story it ends up being annoying. To get used to this type of game no story is probably best. I'll be sure to get this one when I get a game credit. Rated 5 out of 5 by pennmom36 from Griddlers Of The Gods Maybe I'm just having a bad day but I found this game to be somewhat difficult after just a few levels! 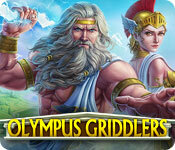 This griddler game has a Greek theme centered around the Gods of Mount Olympus. There are 6 different rooms with approximately 20 levels in each room, with the goal of three gold stars in each level, but you can replay any level to try for a better score. I will say however that when I exited this game, it said that my progress wouldn't be saved! Some of the tiles have coins that are collected and can be used in the shop to purchase bonuses, Two mistakes allowed, Two starting hints instead of one and you can purchase a refill of hints for that level. There are 17 available trophies or achievements to earn, and you will lose a star for each mistake that you make. Enjoy! Rated 5 out of 5 by Village_people from Another good riddles game! Wow, pretty good improved UI here, and good story line added. Rated 5 out of 5 by SandraSwede from Logic nanogram Finally a nanogram where logic can be used to solve the puzzles!!! This game allows you to buy more "mistakes" and "hints" but you won't need them if you like using logic to figure out the puzzles. The game is stingy by only allowing one true mistake before having to restart a puzzle, but this is easily remedied by using earned coins to purchase "mistakes". The music is fine and I always keep it on low as a type of soft background sound. I bought the game after playing the whole demo and I don't regret it. I can't stop playing. This is a no-frills nanogram that uses logic and if you are like I am and never use hints....this is the game for you. Rated 4 out of 5 by J4016C from Enjoying this game I love this type of game. Want to see more! I like to be challenged and this game provides that for me. There really is no storyline. I would like to know what the picture is after it is completed...that is one thing I would change. Rated 4 out of 5 by lynn464 from Olympus Griddlers Can be more challenging the further you get into the game. Found it to be fun to play.